The data field's title can be modified here. Opens a dialog where the title can be entered in multiple languages. The name of the data field can be modified here. The title is used as the data field name whereby the prefix is retained. For string data fields, displays the maximum number of characters allowed. For file data fields, the data type of the primary key is shown here as well, which is used to assign the files. The SharePoint handler class is shown here. 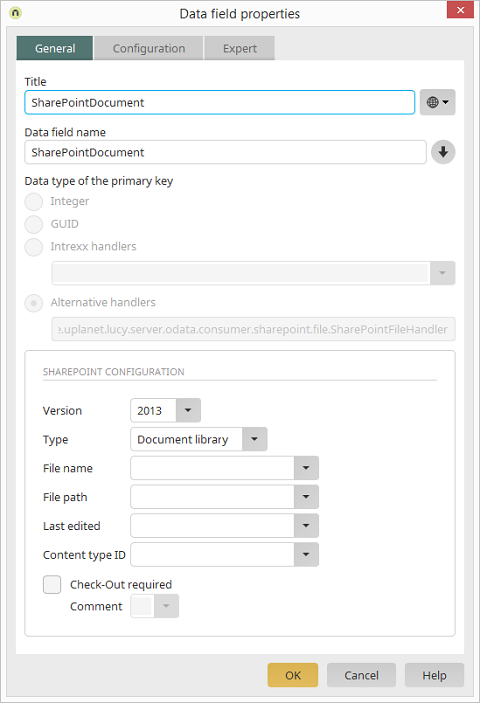 Select the version of your Microsoft SharePoint server. Select whether you would like to use a "Document library" or a "List" here. When using a document library, additional details for ascertaining the metadata are required; these are described below. The type "List" simply requires you to select the version and – optional – setup the "Check-Out" option. For a "Document library", select the field where the name of the file is saved or, where applicable, created. For a "Document library", select the field where the directory, where the files are stored, is saved or, where applicable, created. For a "Document library", select the field where the date of the last edit is saved. For a "Document library", select the field that contains the type of document in the form of an ID so that the documents, which you attach, can be assigned to the correct category later. This option allows you to specify that documents must be checked-out before being edited. You can select the field where comments about the changes made can be entered. This function is only supported by SharePoint 2013. The M-Files handler class is shown here. Here, select the M-Files connection. Based on the selected configuration, all available vaults are listed to which the saved user has permission to access. Select the vault for the documents here. A unique value must exist in order for records in Intrexx to be linked to objects in M-Files. To do this, either a separate field can be used in Intrexx and M-Files, in which a user-specific value is stored as the ID, or the existing M-Files object ID and version are saved in corresponding data group fields. This option provides the greatest degree of flexibility, since this generates an ID in Intrexx (e.g. a GUID) independent of M-Files, which can be changed on both systems afterwards if needed. Assign an Intrexx data field with the data type integer where the M-Files object ID can be stored. Assign an Intrexx data field with the data type integer where the M-Files version number can be stored. With this option, the content of M-Files file fields can also be shown in view tables. This option may require a large amount of processing power, since the documents for each record in M-Files need to be identified. For this reason, it is recommended to only show documents on view pages for one data record. The dg-hyparchiv handler class is shown here. Select the dg hyparchive connection here. Based on the chosen configuration all available departments will be listed, for which the recorded users have access permission. Select the department for the documents. There must be a unique value, so that data sets in Intrexx can be linked with documents in hyparchive. For this, an Intrexx data field with the data type integer is required where the Department ID can be stored. There must be a unique value, so that data sets in Intrexx can be linked with documents in hyparchive. 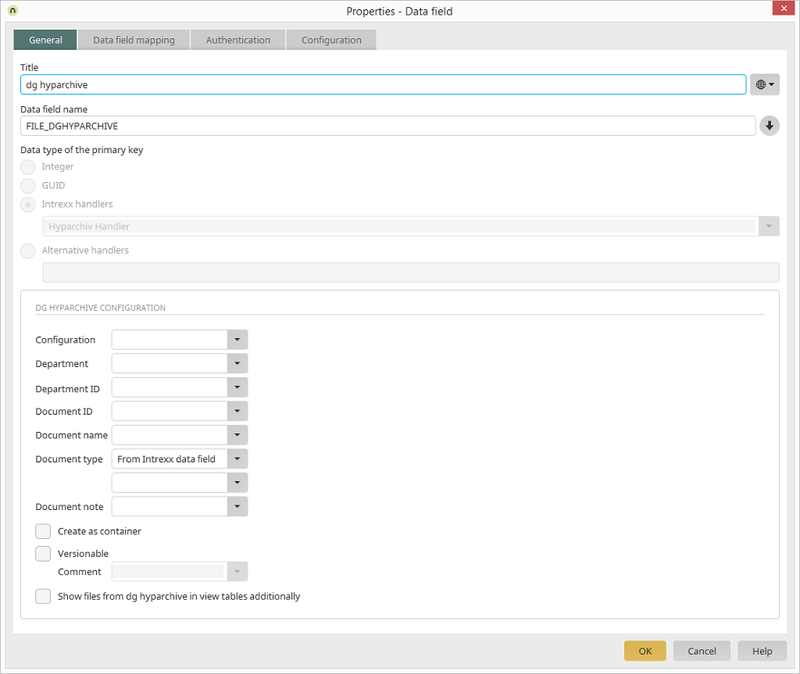 For this, an Intrexx data field with the data type integer is required where the Document ID can be stored. Select a data group field where the name of the document is saved. A document type must be defined for the document. This can either be selected as a constant or defined dynamically via an Intrexx data field for the "Type ID" (data type integer). 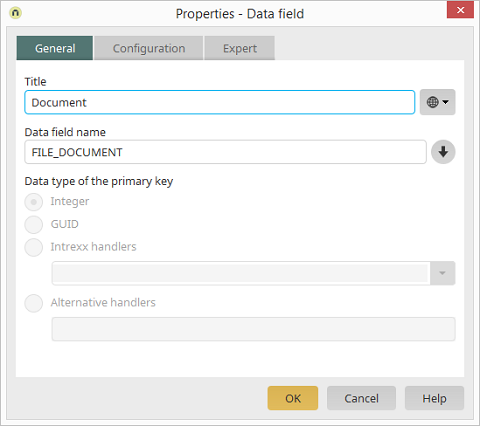 If the document type "From Intrexx data field" is selected, you can select a data field from the application that contains comments for the documents. Determines whether files from Intrexx should be stored as a single document or as a folder in hyparchive. Activates versioning for documents in hyparchive. In addition, a static comment for versions can be recorded or a data group, where comments for versions are stored, can be selected. 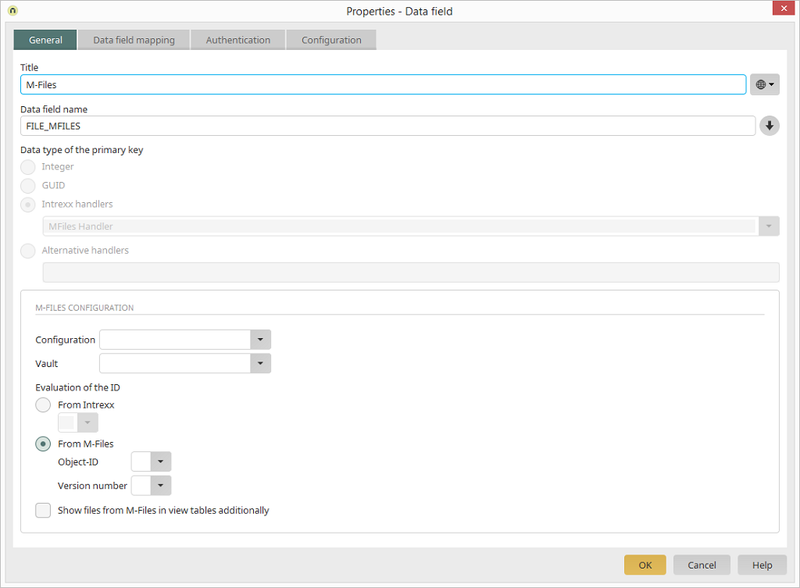 A data field can be selected here where comments for versions can be recorded. The option "Show files from the dg hyparchive in view tables additionally" can lead to a high server work load, because the documents must be ascertained per data set in hyparchive. We recommend that you only display documents on view pages of a data set. The title of the data field and the handler class are shown here. Select your Microsoft Office 365 connection here. Based on the selected target folder configuration in the Microsoft Office 365 connection, all of the available folders that the user has permission are listed here. Select the target folder for the documents. In each case, opens a dialog where the Drive ID and Folder ID can be defined. 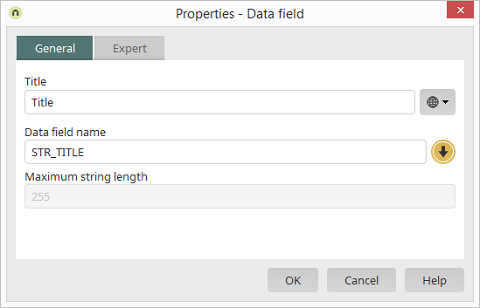 Select the string data field that contains the Item ID. Decide whether single files ("Single") or 1-n files ("Multi-file") should be saved in the data records. 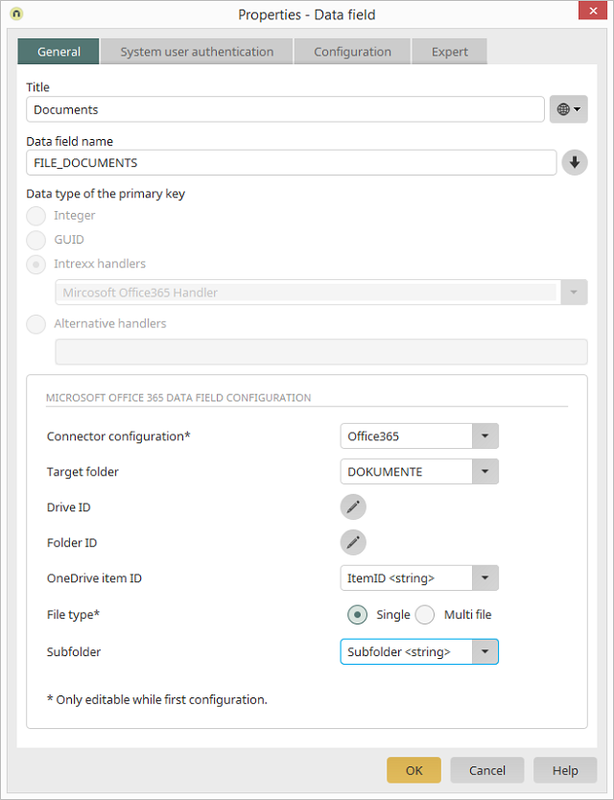 Here, you have the option of selecting a data field that provides the names of subfolders. The corresponding files will then be stored in these subfolders. The ItemID must be included on every edit or view page where files from Microsoft OneDrive or Microsoft SharePoint should be displayed or edited in the application. The files will otherwise not be displayed. Click here for more information. Select the desired connector here. 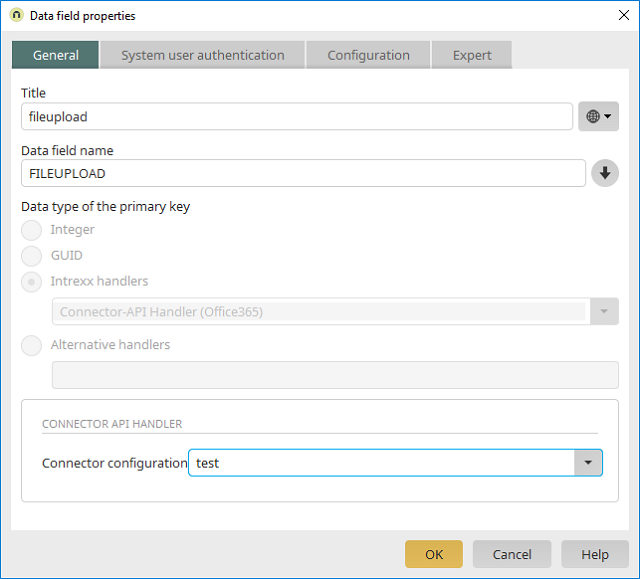 Click here for more information about the Connector API.